In my last post I told you about my dishwasher install project. The process involved shifting the entire face frame, and associated drawers and doors, 6″ to close up a gap at the side of the dishwasher. 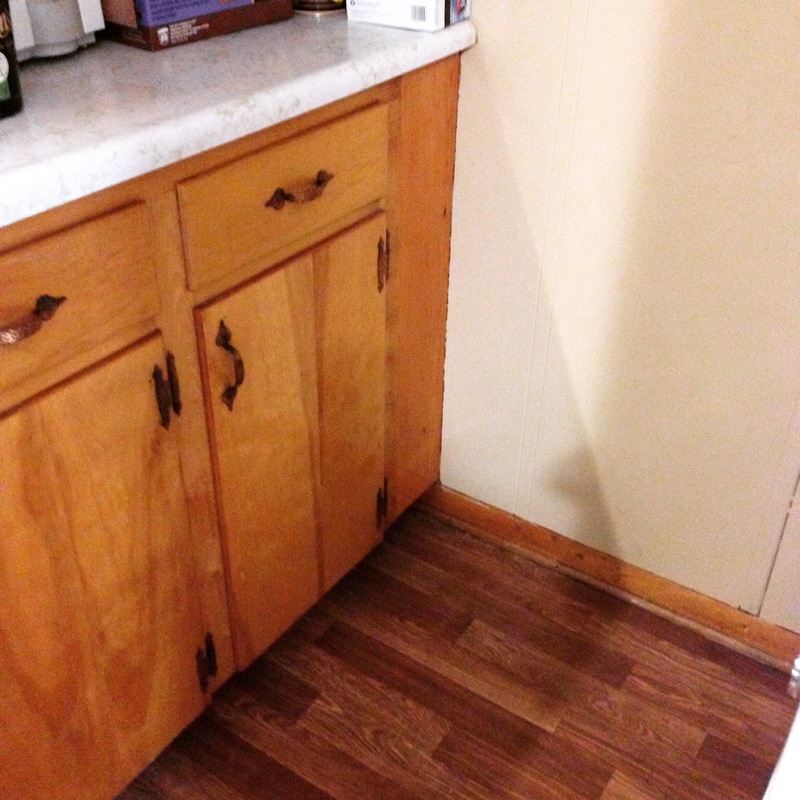 This of course left me with a subsequent 6″ gap where the cabinets met the adjoining wall. Milling up a piece of stock to fill the gap was a simple enough process. Measure, cut, plane and scribe to fit against the wall (nothing is ever truly plumb in a house). I then nailed it into place and filled the nail holes with a little wood putty. With the easy part done, I was faced the more daunting problem of matching the existing finish on my forty-plus year old cabinets. 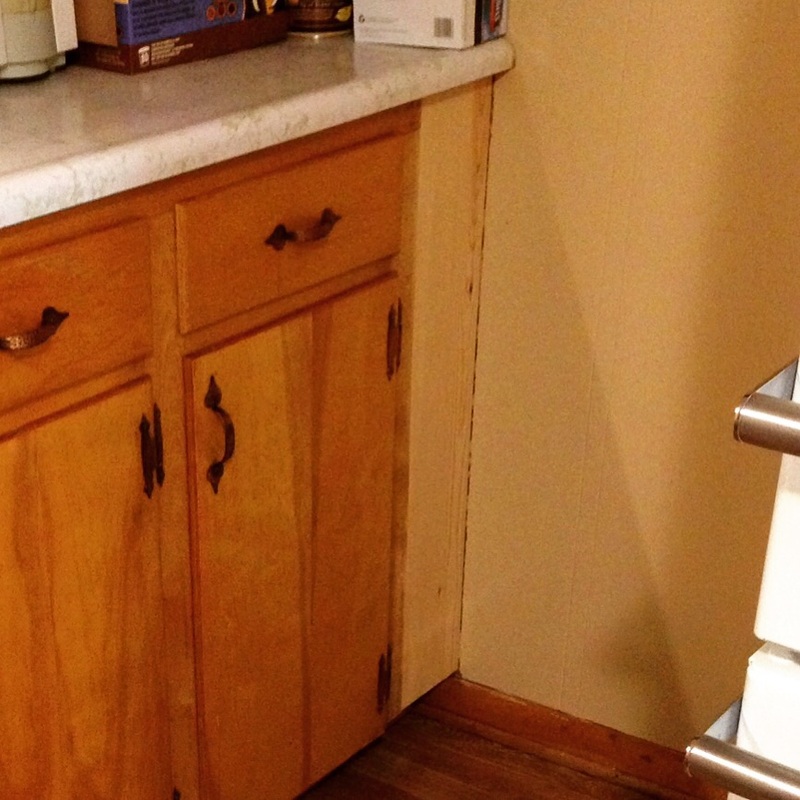 Every bit of woodwork in my house is finished exactly the same as these cabinets. All the trim and every door, as well as the bathroom vanity, which is built in place just like the kitchen cabinets. So I knew it would be in my best interest to figure out how to match both the color and the sheen. If you have been here before, you know that I generally eschew from using any toxic finish medium. My favorite finish to use is Tried & True Original oil finish. Which is a blend of linseed oil and bees wax. The MSDS literally states that consuming large quantities may cause nausea. Can’t get much safer than that unless you don’t use anything. The point is that any finishing medium outside of shellac, wax and oil is outside of my wheelhouse. So I had a little studying to do. My best guess as to the original finish used on the woodwork in my house is that it was a true varnish. I came to this conclusion based on the sheen and how durable it has been over the years. Plus its resistance to water and alcohol. The original finish used also may or may not have contained added pigment or an underlying stain. Everything was/is just a guess. The bottom line is that I needed a finish that had an amber tone, high gloss and would hold up to water and wear. Oh, and match a color that was decades old. How hard could that be? After hours of research and reading I found myself no closer to a solution than when I started. I basically resigned myself to the old standby, trial and error. My frustration led me to the finish aisle in Lowes on my lunch hour Tuesday. After looking at the offerings I decided to start my experimentation with a can of oil based Minwax Polyshades Pecan. I also had to pick up some mineral spirits for cleanup and a natural bristle brush. It’s at this point in the story that I should be explaining how I completed a couple of test boards to verify color and familiarize myself with the product. That’s what I should have done and what I recommend for you to do in such a case. However, I just jumped in with both feet and applied the first coat in reckless disregard for the consequences. The first coat went on without issue, but was a little too light in color. I waited twenty four hours and rubbed out the first coat with steel wool and applied a second coat. This deepened the color and brought the new closer to the old. Another twenty four hours passed and I rubbed out the second coat with steel wool and went for a third coat. The final result is a finish that is quite close to the original in sheen and color. Frankly, I got lucky. The color of the new is a little more orange than the original finish, but it is as close a match that I could hope for. Especially straight from a can of off-the-shelf finish. At any rate, I have found a product that works quite well for my particular needs. Which will prove handy for the next “honey do” project, a kitchen island. This entry was posted in Dishwasher Install, Finishing, Thoughts-Views and tagged finishing, minwax, polyshades. Bookmark the permalink. Just out of curiosity, I’m being puzzled. Don’t your Lowe’s have water base non-toxic varnish or water base non-toxic “varnish stains” in all colours? (I know it takes longer to dry but you can get any colour). Or lemon/orange/garnet shellac? Shellac lacks the durability needed for this particular application. Yes, water based is readily available. Assuming proper ventilation, the oil based finishes pose less of a health concern than the water based. For polyurethane, the MSDS list the health threat level at a 2 for oil based and 3 for water based. On a scale of 1-4, 4 being the worst. This particular product has very little odor and went on easily. It did the job that I needed it to do with minimal fuss. That’s why I wrote shellac for staining and then a transparent varnish. This internet thing makes things so familiar that some times I forget different countries different ways/products/etc. Yep, here in the states you have to do your homework. Water based does not necessarily equate to “safer”. Either version, oil or water based, will work just fine. Its up to the consumer to make the choice that best suits their overall requirements. I think you peeled the right banana there Greg. I used to be in retail paints, and we always had people looking to do just what you did, and many times solved the issue just how you did…. Your “Merritt” badge will be in the mail shortly…..lol (I should just go back to bed but ive got a squeaky dryer to diagnose) good stuff as usual Greg. LOL…I got lucky on my first try. I’m actually impressed with the product. Squeaky dryer…idler pulley? It’s almost always the idler pulley. would have thought so to… But the culprit was a rear drum bearing, no part avail from stock till tuesday, so a tube of sythentic high temp grease has quieted the shrill for now. Eventually I have about 10 spoons and spatulas i need to get cracking on. Looks fine, from the picture at least. It’ll probably fade a bit over time. This kind of matching-an-existing-finish type stuff can be a real trick. I know from work related experience that most companies keep their finishing “recipes” a closely guarded secret. Like I said, I got lucky on my first try. I’m happy with it and time will help blend it a little more.